In this video, I want to reinforce the idea of the Body Mind Earth - HEART connection and new research by the Global Coherence initiative that FURTHER confirms and supports the frequencies of the heart, emotions, brain and body are intimately connected to the frequencies of the earth and further, that our body and nervous system are incredibly sensitive to the magnetic fields and the information that the magnetic fields contain. The scientific community is beginning to appreciate and understand at the deeper level how we are all interconnected very deeply with each other, the world we live in and the universe itself. Idea from quantum mechanics such as entanglement and ideas from quantum field theory along with chaos theory and the butterfly effect show just how connected and one we all are. Add to this the wisdom of the spiritual traditions and it only reinforces are oneness in spirit and consciousness. ​But we are also connected very measureably by the earths magnetic fields its corresponding Schumann resonances and geomagnetic frequencies. Every cell in our bodies is bathed in an external and internal environment of fluctuating invisible magnetic forces. In fact Life and Health Depends on this Connection to the Earth. The convergence of several independent lines of evidence provides strong support for the existence of a global information field that connects all living systems and consciousness. 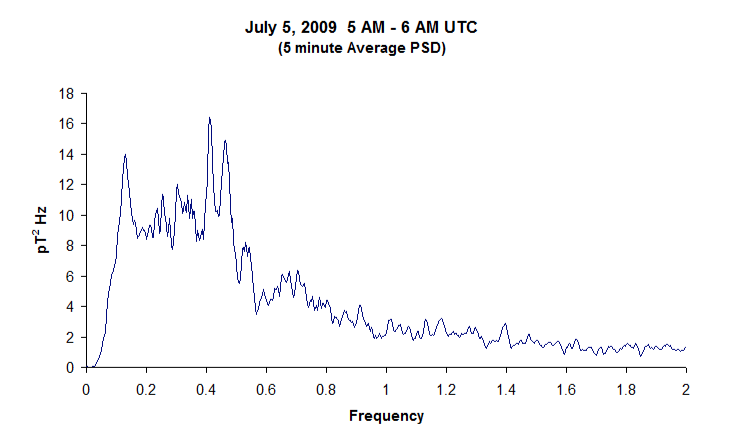 The most likely mechanism for explaining how solar and geomagnetic influences affect human health and behavior are a coupling between the human nervous system and resonating geomagnetic frequencies, called Schumann resonances (Roughly 5-50 Hz , which occur in the earth-ionosphere resonant cavity, and also the earth's geomagnetic sub-hertz frequencies (roughly 0-5 Hz). FASCINATING Short 1 Minute Clip by James Oschman. Life and Electricity Swirl through the Heart Muscles with every heartbeat. There is a resonance between the double helical heart and DNA. Energy Spirals through our bodies and the field of the heart is a vortex. The heart ventricle unrolls with a valve on each end. And It folds up like a double helix. The heart magnetic field is a spiraling toroidal flow extending outwards to 10-15 detectable by science. And extends inward to communicate and energize each cell in the body. 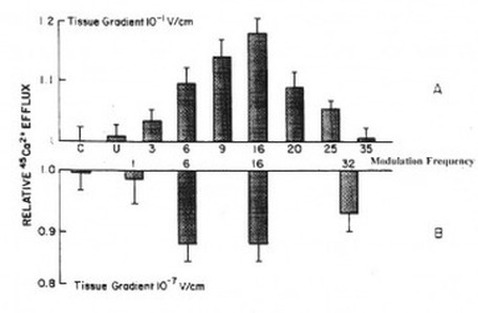 In their investigation, Adey and Bawin found a range of frequencies and intensities in which treated cells responded. Outside of these ranges or "windows"; however, there was no response or only a minimal response at best. The experimentally determined frequency range is know as the Adey Window or more descriptively the biological window of frequencies that living cells respond to in a favorable way. The Adey window corresponds exactly to the primary frequencies of the earth’s Schumann and geomagnetic fields, which we demonstrated is also 0 - 30 Hz. Sisken and Walker AND MORE!! Ionosphere - Big soap bubble around the planet. currents and flow of the plasma. The ionosphere is somewhat of a battleground between the earth's neutral atmosphere and the sun's fully ionized atmosphere, in which the earth is embedded. Bottom of the ionosphere is like a mirror to low frequency electromagnetic waves. Just as a tuning fork has resonant frequencies for sound, so the planet earth and the ionosphere surrounding it have resonance frequencies for electromagnetic radiation called the Schumann Resonances after a guy called Otto Schumann (mid 1950's). Basically the ionosphere with the Earth's surface creates a spherical wave-guide that surrounds the earth. Low frequency electromagnetic waves bounce around this waveguide, which is how radio signals can be transmitted around the globe. The fundamental frequency of this spherical cavity of the earth is 7.83 hertz, which, like a tuning fork, is the earth's fundamental "note". And just as a piano has varying octaves of "C", so too does Schumann frequencies have higher octaves or harmonics, the primary ones being in the 0-50 Hz range, which as we’ll see in the next section is the most important frequency range for or body, mind and cells . very sensitive very specially designed Magnetometers around the planet. These are magnetic monitoring sites that are measuring the magnetic field environment of earth. Different than other magnetometers in that it is measuring the time varying or oscillating magnetic fields and rhythms of the earth. California, Canada, Lithuania, South Africa, New Zealand, Saudia Arabia, Columbia. Reports of Schumann frequencies increasing are nonsense. Second harmonic has biggest seasonal changes. This implies we are more fundamentally connected with each other and earth than we ever thought. Evidence - Luc Montangier - Noble Prize Winner. DNA waves and water. Water interface for interconnection. One was a measurement coil and one was to generate the magnetic field. 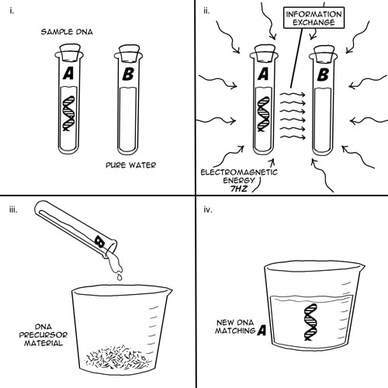 Put a test-tube of water with DNA and measure energy signature. Second test tube of water with just water. Both test tubes where stimulated with a 7.83 HZ magnetic field (very weak), similar to earth. And ONLY if you stimulate both with 7.83, then DNA formed in test tube with pure water with 98% success. Individual Coherence is when you heart, mind, emotions and physical systems are operating in sync and resonating in cooperative alignment. 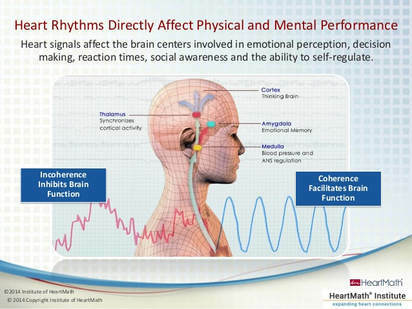 There is also increased physiological entrainment – a number of different bodily systems synchronise to the rhythm generated by the heart (see image below). Finally, there is increased synchronisation between the activity of the heart and brain. 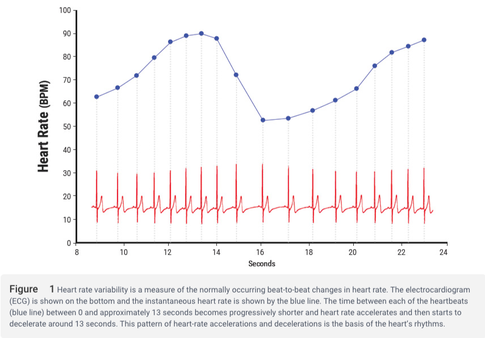 The top graphs above shows an individual’s heart rate variability, pulse transit time, and respiration rhythms over a 10-minute period. 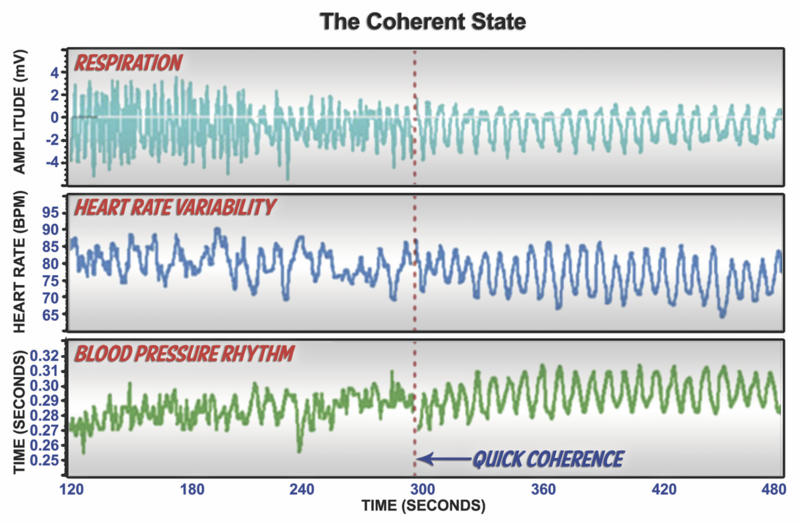 At the 300-second mark, the individual used the freeze-frame positive emotion refocusing technique, causing these three systems to come into entrainment. THIS IS THE SAME FREQUENCY AS THE EARTHS MAIN GEOMAGNETIC PULSE!!! Body Mind Earth Heart Connection!! 0.1 Hz - Same frequency as coherent human heart rhythm. In general humanity is synchronized together with the slow wave heart rhythms because we are all synchronized together with the earth. On some level we are all connected. not in sync with each other and rest of the earth. When we get in a coherent state, we not only get into alignment with our higher self, we are also connecting with the larger earth field environment and putting more coherence , love and appreciation into the field environment. 100,000 Photons a second measured from a Heart Centered Meditation compared to only 20 per second without meditation. Perhaps Enlightenment is MAINLY about EN-LIGHTEN-ING YOUR HEART WITH LOVE!!! See Study at link below! person with an actual need must be identified as a receiver of the transmitted light. Under these conditions, a sustained light emission of 100,000 photons per second was measured, where only the background count of 20 photons per second was observed without meditation. Everyone is familiar with such expressions as “put your heart into it,” “learn it by heart,” “speak from your heart,” and “sing with all your heart”—all of which suggest that the heart is more than just a physical pump that sustains life. When the heart beats it creates a magnetic field. Not an aura. Magnetic fields carry information. Emag carrys information radio cell phones. We work the same way, magnetic fields don't just work with cellphones to carry information. Electrocardiogram - Called that because we are measuring electricity. Current. Middle school physics, whenever you have a flow of current, you create a magnetic field. Magnetometer. (Mag-nah-tom-eter). 3 field heart… couple inches brain. Measure magnetic field with a $40,000 magnetometer 3 feet away. Signal averaging of people 5 feet away. Our systems are much more sensitive. Works even with barriers between the people. One of the first physiological measures of empathy. We have all had the experience of walking into a friends house, or a party and something feels odd or off. Bad news, angry. Feel the tension in the air. Feels good to be around certain other people. Magnetic field acts as a carrier wave for our emotional state. Rhythm of heart reflects emotional state. 75% accurate for detecting heart emotions. The core of the HeartMath philosophy is that the heart, physically and metaphorically, is the key to tapping into an intelligence that can provide us with fulfillment. Science has shown that the heart communicates with the body and brain on various different levels. The heart sends neurological information to the brain and the rest of the body. Animals very sensitive. All energetic. They seem to know when you are coming home. Signal averaging - Technique to determine if two signals are in sync or not. Mother's brainwaves synchronize to heartbeat. Modulated by intention. We are all connected in the field. What are you feeding the field environment. We are suggesting in essence that this encoded information is communicated nonlocally between people at a subconscious level, in effect linking all living systems. Magnetic fields act as carrier waves for this information, which can influence all living systems – positively or negatively – within the field environment as well as our collective consciousness. flow of current creates a magnetic field. Magnetic fields are unique because they go through things, that is why a cellphone works inside of a building. Magnetic field between cellphone tower and your cellphone carries the information say of the photograph you just took, or the conversation or the text is carried by the field. Information of the heart also carried by magnetic fields. Information of different emotional states looks very different. We are like antennas. Our nervous system is one big receiving antenna. We can detect that information in other peoples fields, and it can affect us and our body. Like a room full of people that our negative. Has a measurable effect on us, it drains our energy. Puts us into a more incoherent state (unless we learn to stay centered). Heart coherent state of one helps others. IMportant in our interactions with others. One of the best things we can do to help a troubled person is to maintain our inner composure. Allign with deeper heart and true self. Intuition wisdom. Heart sends more information to the brain then the brain sends to the heart. Heart and brain more connected through the nervous system than any other organs in our body. Nerves connect heart and brain. Afferent and ascending information and it is also rhythmic - a conductor of all the information in the body. Psychopsiology - messages from the heart to the brain, directly affects perception. Corticol inhibition or facilitation - 1970s. Heart acting as if the heart had a mind of its own. Current thoughts are entire nervous system is more or less dumb, just dancing to the brains commands. Discovered heart didn't take orders from the brain. Rhtyhms of the heart shift to a very different mode when we are feeling good. 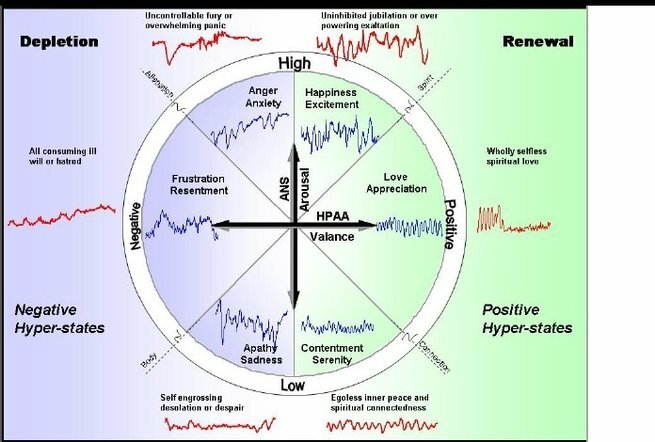 rhythms of heart shift into a very different mode called heart coherence when we feel positive emotions like love, compassion , appreciation, etc. hundreds of papers. Over 200 studies, showing this is the optimal state. (heart math). The Heart Rate Variability or HRV is a measure of the normally occurring beat-to-beat changes in the heart rate. This electrocardiogram (ECG) is shown on the bottom and the instantaneous heart rate is shown on top. You can see the heart speeding up from 0-13 seconds and slowing down from 13-16 seconds and increasing again. HRV is the beat to beat changes in your heart rate, and is due to the synergistic action of the two branches of the Autonomic Nervous System (ANS) – the part of the nervous system that regulates most of the body’s internal functions. The sympathetic nerves act to accelerate heart rate, while the parasympathetic (vagus) nerves slow it down. The sympathetic and parasympathetic branches of the ANS are continually interacting to maintain cardiovascular activity in its optimal range and to permit appropriate reactions to changing internal and external conditions. We all radiate an electromagnetic field - been measured. In one study , 3 people sitting at a cartable with heart coherence. There heart coherence was measured before, during and after. Coherence is where your heart, mind, emotions and physical systems are operating in sync and resonating in cooperative alignment. 4th person sat quietly … 4th persons coherence went up too, just from being in that energetic coherent field. Experiment done 10 times including 40 people. When we are coherent, it has a lifting effect on people around us. Objectives: This study examined whether a group of participants trained in achieving high states of heart rate variability coherence (HRVC) could facilitate higher levels of HRVC in an untrained subject in close proximity. Design: Fifteen adult volunteers were trained to increase their HRVC. In a series of 148 10-minute trials using six different experimental protocols, three of the trained participants were placed together with one of 25 additional volunteers to test whether the three could collectively facilitate higher levels of HRVC in the fourth. Results: The HRVC of the untrained subject was found to be higher in approximately half of all matched comparisons and was highest in cases where all four participants focused on achieving increased HRVC. A probit analysis revealed a statistical relationship between participants' comfort with each other and trial success. Greater levels of inter-group comfort were seen to be positively linked to increases in HRVC. Evidence of heart rhythm synchronization between group members was revealed through several methods, including correlation analysis, coherence analysis, wavelet coherence analysis, and Granger causality tests. Higher levels of HRVC were found to be correlated with higher levels of heart rate synchronization between participants. Conclusions: These results suggest that a coherent energy field can be generated and/or enhanced by the intentions of small groups of participants trained to send coherence-facilitating intentions to a target receiver. This field is made more coherent with greater levels of comfort between group members. The evidence of heart rhythm synchronization across participants supports the possibility of heart-to-heart bio-communications. (Altern Ther Health Med. 2010;16(4):62-72). Morris, Steven PhD. Achieving Collective Coherence: Group Effects on Heart Rate Variability Coherence and Heart Rhythm Synchronization. Alternative Therapies in Health and Medicine, A Peer-Reviewed Journal, 2010; 16 (4):62-72.
magnetosphere, solar flares, cosmic rays, etc. They used Heart Rate Variability data records central nervous system activity. Groups of people are synchronized to the earths time varying magnetic field. Rhythms/Frequency in field are what matters (time varying field). It is exciting to see indications of interconnectedness between the GCI Compassion Operatives who participated in the study and the energetic factor such as solar and planetary magnetic field activity. This helps to confirm some of the research that has been discussed in GCI commentaries in the past. 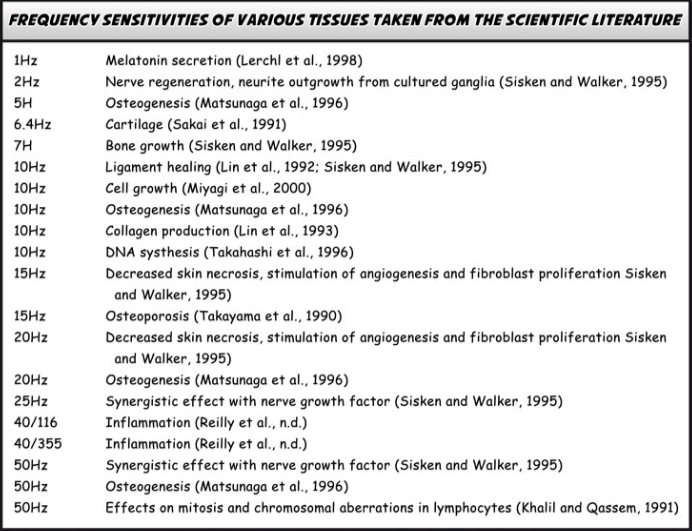 For example, environmental scientist Neil Cherry, 2001, reviewed a large number of studies that identified significant physical, biological and health effects that are associated with changes in solar and geomagnetic activity. Consider that the brain and heart rhythms and the Schumann resonances and geomagnetic field line resonances overlap, and changes in these resonances caused by changes in Solar Wind Speed or solar flares can in turn influence the function of human, and animal, brain and heart patterns in the GCI Commentary, Influence of Geomagnetism and Schumann Resonances on Human Health and Behavior, July 15, 2009). There are a lot of benefits for us getting our hearts into that coherent rhythm personally. Lowers blood pressure, helps to release beneficial hormones. Neurochemical benefits. The feelings we have inside of us, are not just inside us, they radiate and reach outside of us. Put electrodes across body with an electrocardiogram, what the doctors are measuring is electricity, quite literally. We know from basic physics that whenever there is a flow of electricity you create a magnetic field. So the heart creates a magnetic field inside and outside the body that is measurable with sensitive magnetometers. We can measure 3 feet away. Brain only one inch. The heart is the big field here. Analyze the information carried by those fields. The magnetic field of the heart carries emotional information. Just like a cellphone. How is the information of the voice, text, picture , video ,etc, how does it get from our phone to the cell tower? Its carried by magnetic fields and its the magnetic component as to WHY it works inside. Magnetic fields PENETRATE. We work the same way. 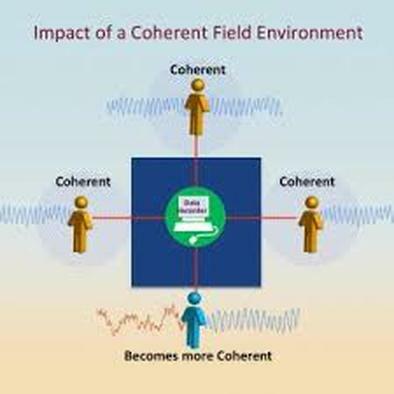 Experiements have been done to measure information exchange between individuals and it was discovered we not only emit these fields we can detect and encode them. One thing you can do is invest in an earth based PEMF system. This will help you to recharge your cells, improve circulation, oxygenation, better sleep, and healing and regeneration. Most important, an earth based PEMF system like the iMRS 2000 helps to reset your body, brain and heart to the earth's natural pulsations which helps create global coherence in your body which as you have seen can have dramatic positive changes. Further, the iMRS 2000 use a HRV heartrate variability sensor that not only gives you a customized session every time to what your body needs BUT over time can actually improve your HeartRate Variability HRV score. Hearthmat has many techniques I also highly recommend... SEE BELOW. Goal is to have a choice respond instead of react. We do have a conscious choice as to what we feed the field. At the end of the day ask yourself, what did I feed the field today? We are always connected to and feeding the field. What percentage of the day was I really more caring, more kind to people and more appreciate… vs frustration, impatience, anger or worry. When we get into a heart coherent state, we sync with earths magnetic field and add more love and harmony into the earths field. We need to learn to self regulate and add coherence to the earths magnetic field. What are you feeding the field. Maintain our own inner peace and composure. Understand this is part of the shift. Media is the worst at creating global stress. Good karma is by choice not chance. Kindness revolution. There is a planetary shift going on, and part of that shift is that the old structure have to get broken down and so extreme to influence change. It boils down to a growth in consciousness that is a deeper connection to the inner heart and the measurable heart coherence that goes with it. The more people that learn about it and talk about it the better! State of harmony and flow and connection. Heart and Brain work synergistically. More intuitive access and flow. Care is love in action… be active in the world. Do it from a place of deeper care. Energetics - systems we cannot see or touch. Mind and heart feelings are primary drivers. Critical facilitation is the state of optimal mental function. We feel better, think better, faster reaction times, able to maintain our composure, even when we are in the traffic jams of life. That is where we can impatient and upset and make bad choices. 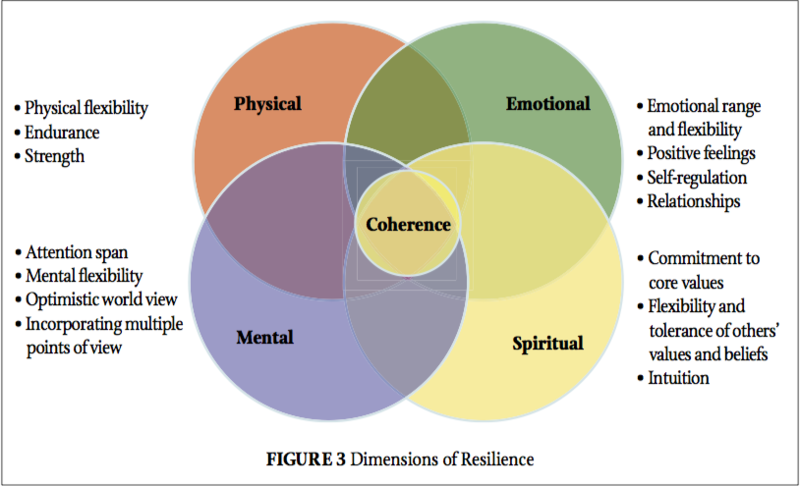 Heart coherence helps brain and body to all work together to self regulate. Improvements in memory, grades, ADHD and learning. Hearet to amygdala - center of emotion. Rhtyhms of the heart are specific to their emotional states and brain interprets. Both heart and brain responded before you saw the picture in a way that predicted what kind of picture that was going to be. Snakes, criminals with knives vs nature scenes etc. then you saw brain respond, before you saw the picture, than the body responds (stress response). Then the picture. Body is what we feel, but comes last. 1) implicit knowledge - fast track circuit .. based on past, brain. 2) Energetic sensitivity - very real signals in environment. Like someone staring at you. Ability to feel earthquakes, weather. No doubt our nervous system can response to changes in earths magnetic fields. 3) Nonlocal intuition - Like mother knows kid is hurt or something happened on other side of planet. Heart and brain seem to have access to a field of information not bound by time and space. Nonlocality proven. Larger self. Heart has ability to enhance brain performance. 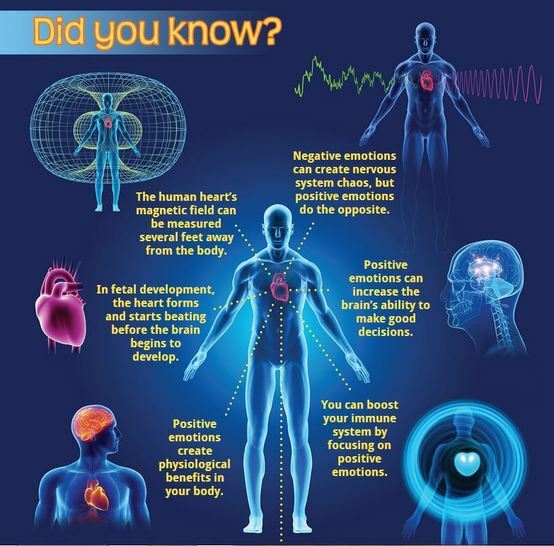 Emotions drive physiology - heart lockin. Connect with the heart and make better choices IN THE MOMENT. Maintain composure. In that staff meeting and that person does that thing they always do. Heartmath techniques came from studying physiology. Allows us to do something different in those situations. Instead of stress reaction, more inclusion and problem solving. Research is more and more showing that THERE IS something that might be called the “intuitive heart” or “spiritual heart.” The intuitive heart is what people have associated with their “inner voice” throughout history. each year, more and more people are including the practice of “listening” to their hearts for inner guidance or to what some refer to as their “higher power”—a source of wisdom and intelligence. In research conducted in our laboratory, we found that coherence is of prime importance in connecting us with our intuitive inner guidance. Humanity is synchronized together with the slow wave heart rhythms BECAUSE we are all synchronized with the earth. It is amazing. 3 subgroups , people not in sync is one. Shift out of the head, and focus on the area around your heart. Keep your attention there for at least ten seconds. Continue to breathe normally. Recall a positive time or feeling you had in your life, and attempt to re-experience it. Remember, try not simply to visualize it, but rather to feel it fully. Ask a question from the heart: "What can I do in this situation to make it different?" or "What can I do to minimize stress?" You may hear nothing, but perhaps feel calmer. You may receive verification of something you already know, or you may experience a complete perspective shift, seeing the crisis in a more balanced way. Although we may not have control over the event, we do have control over our perception of it. Cut-Thru is a technique developed to help us better manage our emotions. It gives us the ability to "cut through" complex, long-standing emotions, and dynamically move from one place to another. Be aware of how you feel about the issue. Focus in on your heart. Assume objectivity. Act as though it were someone else's problem. What kind of advice would you give this person who's just been slighted by a co-worker? You'd probably say, "Hey, relax, it's no big deal." Take the distorted feelings, the emotional energy that is out of balance, and bring it to the heart. Let it soak there, as if you were soaking in a warm bath. Practice letting the heart do the work for you. Cut-Thru tends to require more mature contemplation than Freeze-Frame. But it is also more useful with deeper, and more complicated issues. Long-standing emotions have been stored in us through our life experience. Cut-Thru gives us the ability to transform instead of repress. Heart Lock-In - Rather than fixing something, Heart Lock-In is about experiencing your heart at a deeper level. Shift your attention away from your mind and focus on your heart. Remember the feeling of love or care you have for someone whom it's easy for you to love. Focus on a feeling of appreciation for someone or something positive. Try to stay with that feeling for five to fifteen minutes. Gently send that feeling of love or appreciation to yourself and others. In fifteen minutes, a Heart Lock-In can provide physical, mental and spiritual regeneration. At the individual level, a person's level of heart coherence can be assessed by monitoring the rhythmic patterns that are reflected in their heart-rate variability (HRV), the beat-to-beat changes in heart rate. Ongoing feelings of impatience, frustration, irritation, worry, or blame throw our inner rhythms out of sync and have a negative carryover effect on our hormonal and nervous systems.